Russia tightened its control Wednesday over a second breakaway region of Georgia, with President Vladimir Putin and the leader of South Ossetia signing a new treaty that calls for nearly full integration. Georgian President Giorgi Margvelashvili denounced the signing as a "destructive" move against his nation's sovereignty and territorial integrity and said it would further exacerbate tensions. The United States, the European Union and NATO also strongly condemned the signing. 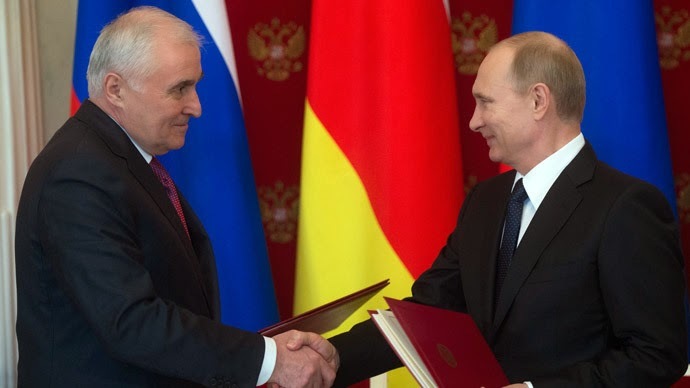 Under the agreement signed Wednesday in the Kremlin, South Ossetia's military and economy are to be incorporated into Russia's. The treaty also promises to make it easier for South Ossetians to get Russian citizenship and to raise salaries for civil servants and state pensions. Tens of thousands of Georgians joined a protest rally Saturday in the ex-Soviet republic's capital Tbilisi to demand the government's resignation, claimed it has mishandled the battered economy. 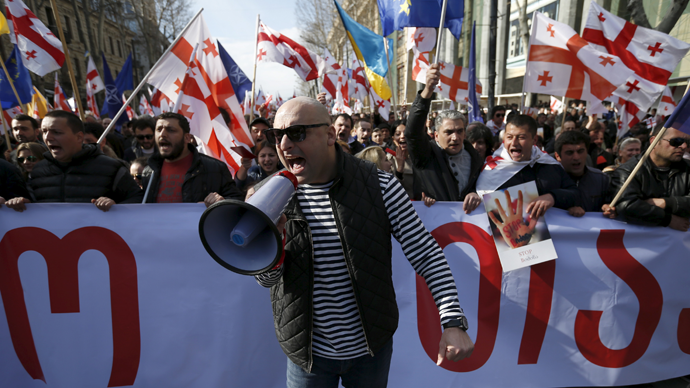 Protesters packed Tbilisi's central Freedom Square after being called onto the streets by exiled former president Mikheil Saakashvili's United National Movement (UNM), before marching towards the State Chancellery building, the seat of government. Saakashvili addressed the rally by video link from Brussels as the cheering crowd chanted his name. "We are united by our shared task to liberate Georgia from the government which destroys our country," Saakashvili said in an emotional address. Irakli Alasania, leader of opposition Free Democrats, said his party, which holds eight seats in the Parliament, will not join UNM parliamentary minority group’s initiative to launch no-confidence vote against the government. Alasania, Georgia’s ex-defense minister, made remarks while speaking with Georgian journalists in Brussels, where he met NATO Deputy Secretary General, Alexander Vershbow. The Georgian Prosecutor General’s Office on Saturday modified the charges against five former high officials, including ex-president Mikheil Saakashvili. In Saakashvili’s and former Interior Minister Vano Merabishvili’s cases, the charges were clarified, but when it comes to former Justice Minister Zurab Adeishvili, former Defense Minister Davit Kezerashvili, and former Tbilisi Mayor Gigi Ugulava, the charges were made more serious. A long awaited plan by the European Union to import Caspian gas moved forward this week as construction work began on the Trans Anatolian Natural Gas Pipeline (Tanap) in Turkey. Tanap is the central link in the EU-backed Southern Gas Corridor, a jigsaw of existing and planned pipelines designed to diversify Caspian energy export routes and reduce European dependence on Russian gas. Estimated to cost $10bn, Tanap will tie into the existing South Caucasus pipeline that already supplies Azerbaijani gas to Georgia and east Turkey, and transport gas over a distance of 1,850km to Turkey’s western border with the EU. From there, gas is expected to enter the planned Trans-Adriatic Pipeline crossing Greece and Albania to Italy. At least three Armenian soldiers were killed and four wounded in clashes with troops from Azerbaijan on Thursday near the breakaway Nagorno-Karabakh region, but the two sides gave conflicting death tolls and disputed who was to blame. The separatist region's defense ministry said in a statement that three Armenian soldiers had died after Azeri commandos attacked their position. "The Armenian side forced the enemy to escape after a two hour clash," the statement said. President of Armenia Serzh Sargsyan thanked Russia for the support that the country has provided to Armenia since independence. Speaking during a media forum in Yerevan, he said military and technical cooperation plays a great role in relations with Russia. “In this term, we are concerned about the fact that Russia, due to different reasons, is selling weapons to Azerbaijan, and the problem is not the quality of weapons, but the fact that an Armenian soldier standing on the border realizes that they are trying to kill him from Russian weapons,” President said during “At the Foot of Mount Ararat” media forum. 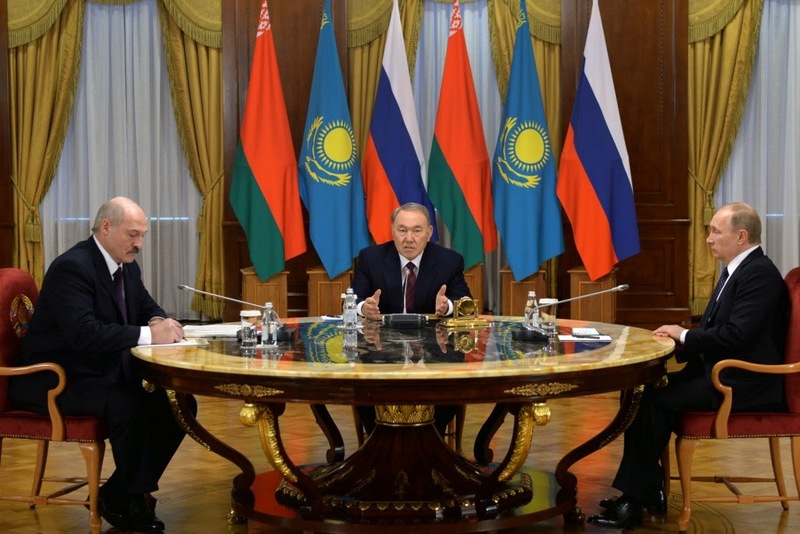 Putin Pushes EEU Integration As Kyrgyzstan Fears "Ukrainian Scenario"
President Vladimir Putin proposed on Friday creating a regional currency union with Belarus and Kazakhstan, Russia's partners in a political and economic union made up of former Soviet republics. Putin made his proposal at a meeting with the Belarussian and Kazakh presidents which highlighted the challenges facing the Russian-led Eurasian Economic Union following the fall in global oil prices and the decline of the Russian rouble. "The time has come to start thinking about forming a currency union," Putin said after the talks in the Kazakh capital Astana with Belarussian President Alexander Lukashenko and Kazakh President Nursultan Nazarbayev. Some 30 representatives of Kyrgyzstan's Communist Party and the Russian World Foundation picketed the U.S. Embassy in Bishkek, protesting appointment of Richard Miles as the interim Charge d'Affaires at the U.S. diplomatic mission in the Kyrgyz capital. The leader of the Kyrgyz Communist Party, Klara Ajibekova, attended the rally on February 27. She told RFE/RL that the arrival of Mr. Miles to the post was a "significant event" as "in every country, where Miles worked as diplomat, armed conflicts erupted," and therefore "we do not want Kyrgyzstan to find itself in such a situation." Richard Miles assumed the position of interim Charge d'Affaires at the U.S. Embassy in Bishkek, Kyrgyz Republic, on February 13, as the arrival of Ambassador designate Sheila Gwaltney is still pending. Kyrgyz parliament suggests checking the activities of all Turkish schools "Sebat" in case of violations to close them. This was stated by the deputy Zhyldyzkan Dzholdoshova. According to her, she read that the head of Turkey Recep Tayyip Erdogan negatively spoke about these schools. "It means a lot. I believe that it is necessary to check these high schools. We must form a government commission or law enforcement agencies have to check it. Moreover, not only catering, but also what they teach our children," she added.